Conference side Aldershot Town have signed teenage MK Dons striker Kabongo Tshimanga on a one-month loan deal. The 18-year-old made his senior debut against Port Vale in the FA Cup in November and signed a professional deal with the Dons earlier this month. 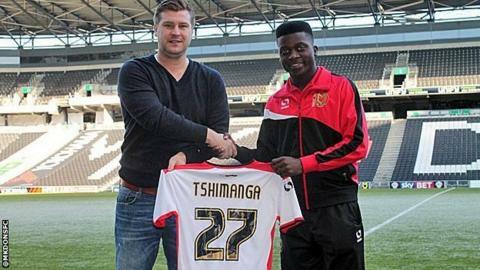 Tshimanga has been prolific for the League One club's Under-18 side this season, scoring 42 goals in 25 outings. He is contracted to remain at MK Dons until the summer of 2016, with the option of an extra year.